In La Plagne, one of the most beautiful ski resort in France, is this cozy chalet situated that is highly suitable to bring your ski holiday to a big success. 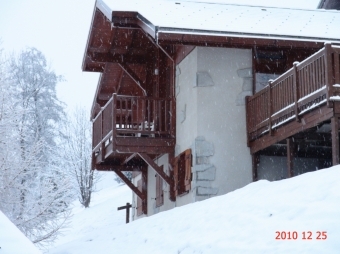 The chalet is directly situated next to the slopes, so you can start directly with skiing. You can stay with up to 8 persons in the chalet. The chalet has a floor area from almost 100 m2 and moreover a terrace of no less than 40 m2. On the terrace you have a splendid view concerning an unique mount chain. Moreover the chalet has been designed according to the traditional Savoyard construction style. The position in combination with the fantastic surroundings turns your ski holiday into an unforgettable event. The chalet is fully equipped to have a comfortable holiday. Thus, you have at one's disposal (Dutch) TV, both above and below toilets and a delicious fireplace where you have a wonderful view on the Massif de Beaufortain in La Plagne in France. La Plagne is a ski resort in the French Alps in the Savoie department. It is known by the stages in the tour de France. In the winter is this a very popular ski resort. At the end of 2003 there is made a decision to connect the ski resort La Plagne with the ski resort Les Arcs. Because of this a very large ski area has arisen, namely Paradiski. With a total of 425 kilometers of slopes and 143 ski lifts belongs Paradiski to the top 3 world’s largest ski resorts. Click here for more information about the ski resort and the surroundings.